The one way to enhance productivity, improve yield, and lower costs is by superheating blast furnace iron with an Ajax Tocco channel induction furnace prior to charging a BOF or arc furnace. The illustration below details an a typical Ajax Tocco design. Red Line to indicate high metal level. 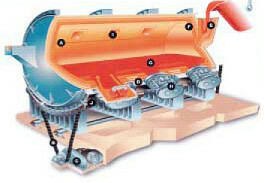 Heavy duty, triple strand drive chains on each end of furnace shell providing maximum security for rotating furnace. Electrically actuated reversable gear box chain drive for accurate pour control. Fully cylindrical, low-stressed steel shell designed for maximum refractory support. Controlled atmosphere for good refractory life achieved by submerged fill and pour spouts with close-seal access doors. High alumina pre-fired bricks with total thickness of 685mm for protracted refractory campaigns. Combined electromagnetic stirring action of six jet flow inductors ensures consistant analysis and tempurature throughout the bath irrespective of metal level. Six 2.5mW "Jet Flow" inductors giving total furnace electrical rating of 15mW. Three doors provided in the event of slag removal is necessary. Maximum support for furnace shell is given by means of independent roller bases which also help to ensure easy and smooth pouring.